Screening off the neighbours; this has got to be one of the most common reasons behind any tree or plant purchase. And an off-shoot of this, but still relevant is beautifying that elaborate structure that has been put into place to block the line of vision! A uniform row of plants planted closely together, hedges comprise of any singular grouping of plants, whether that be three or 10. 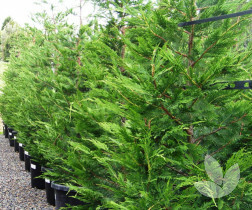 With so many greening alternatives to choose from depending on the situation, it is a good idea to consider purely and simply what you wish to achieve with a tree purchase rather than rushing out to buy any tree that appears to meet the bill. Try answering the following questions - how tall does the tree need to be - two, three or six metres? Does its structure need to be tight and bushy or can it be more open? Do you want it to be a flowering screen or only full at a certain time of the year? Hedges mean many things to many people, and understanding the need to hedge is important before choosing the right type of tree. For a formal hedge it is recommended to select trees and plants with dense twiggy growth which is then constantly clipped to retain a regular shape. Clipping suppresses most of the flowers and fruits so the end result is a fluidness of foliage suitable for screens, walls and fences. Semi formal hedges are a little more relaxed as trees and plants have been allowed to develop some flowering and fruiting wood. This type of hedge is not subjected to meticulous clipping like its formal counterpart and the end result is something that still does the job while retaining some of its own natural personality. At the other end of the spectrum are informal hedges where the clipping of any tree or plant is done very infrequently. 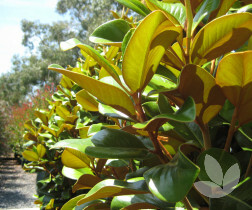 Great for driveways, large walls and fence lines, this row of trees is literally just kept tidy, allowing them to exhibit all of the natural branching and flowering characteristics of their species. As most hedges are planted for privacy, the year-round green foliage provided by evergreens make a logical and natural selection. However, don’t underestimate the visual and colour interest created by a deciduous hedge line. The main advantage of using deciduous trees and shrubs for a screen or hedge is letting in winter light, but many exhibit different features in all four seasons; beautiful bare branches and twigs in the winter, flowers in the spring, a thick summer screen with shade and protection from hot winds in summer and the rustic charm of autumnal foliage. 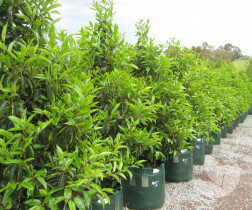 The breadth of trees for this purpose is growing all the time (pardon the pun) as nurseries offer a greater palette and landscapers get more adventurous with use and selection. In the Lilly Pily family, Waterhousea is a traditional option for large hedges and screens. Full and bushy with a pendulous habit, it can be shaped with shears or left for a more informal look. This is a big line for us so stock can move very quickly. 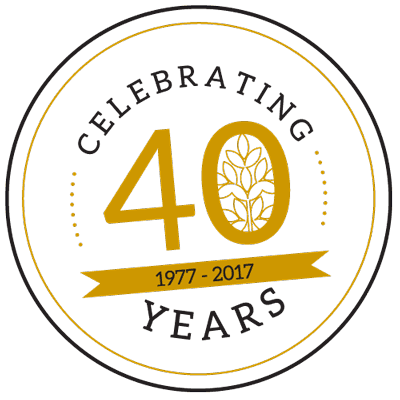 Available in 50L containers & 100L, 150L and 300L bags. This is a moderately tight growiing Lilly Pilly great for clipping into smaller hedges to define areas in the garden. It has green foliage with a golden hue. Clipping is only minimal though as it has a naturally uniform habit. We have great looking specimens in 50L containers and 100L bags. Rivalling the Lilly Pilly in function and popularity are conifers. One in particular is Cuppressocyparis 'Leightons Green'. Planted tightly and clipped these large, good looking specimens with fine deep blue green foliage, create a great formal structure in a landscape. Clipped regularly, a row of 'Leightons Green' is definitely an attraction in itself. 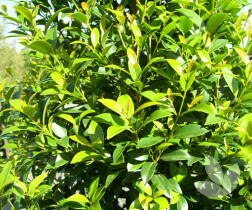 Or alternatively planted wider apart and left to grow, they are one of the best informal hedges that perform reliably. A truly great option and currenlty available in 50L containers and 100L bags. Be Quick! 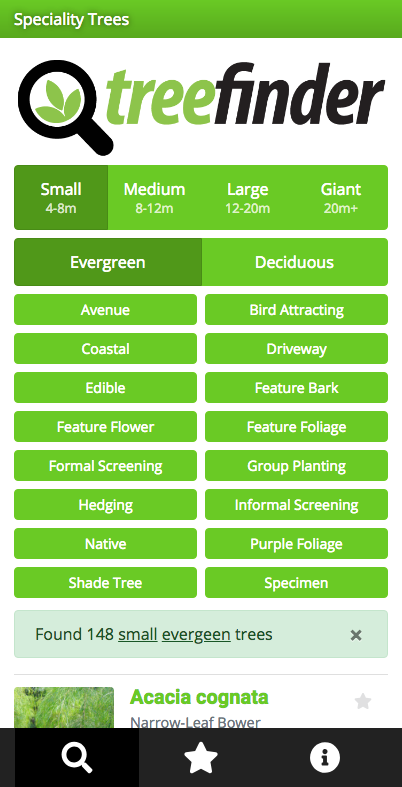 A flowering hedging option. 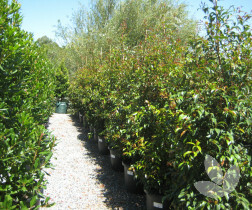 This is an evergreen tree with blackish-brown bark, glossy dark green oval leaves and small white flowers. The flowers run on long bracts and these are often clipped for the tree to keep its formal shape. We have good looking material in 40cm and 50L containers. Combining dense glossy green foliage with big, beautiful milky-white flowers, the newer selection of dwarf magnolias make a classy feature wall. 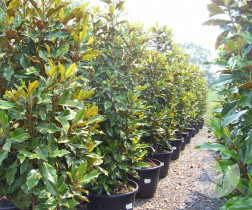 A popular specimen is Magnolia 'Teddy Bear' with its dense growth and plump and shapely, cup-shaped leaves. You just have to see our magnificent stock! We have premium material 40cm, 50L and 100L. This is a beautiful specimen and great for an informal screen. With a distinctive wavy leaf, creamy-white flowers and fuller figure compared to say a 'Little Gem' or 'Exmouth', 'Kay Parris' is making a splash. Come and see our material in 40cm, 50L, 100L, 150L and bigger.